With more conflict over religious liberty in the United States and high-profile martyrdoms around the world, it would seem Christianity is in global peril. But that’s not the case, according to a new report. Published in the International Bulletin of Missionary Research, the findings of the Center for the Study of Global Christianity at Gordon-Conwell Theological Seminary provide an optimistic picture of Christianity heading into the heart of the 21st century. The 31st annual edition of the report included numbers on Christianity and other world religions from 1900, 1970, 2000 as well as projections for the rest of 2015, 2025, and 2050. Here are seven positive trends within Christianity across the globe. Currently, there are more than 2.3 billion affiliated Christians (church members) worldwide. That number is expected to climb to more than 2.6 billion by 2025 and cross 3.3 billion by 2050. But it’s not just numerical growth, Christianity is growing in comparison to overall population. More than one-third (33.4 percent) of the 7.3 billion people on Earth are Christians. That’s up from 32.4 percent in 2000. By 2050, when the world population is expected to top 9.5 billion people, 36 percent will be Christians. Those positive numbers are due to explosive growth in the global south. Only in Europe and North America is Christianity growing at a less than one percent rate. In Africa and Asia, the rate is currently more than double and will continue to climb. Today, more Christians live in Europe than Africa. By 2050, more than 1.2 billion Christians will live in Africa, more than the number in Europe and North America combined (and more than the total population of every other religion except Islam and Hinduism). By that time, almost 1 out of every 8 people in the world will be an African Christian. It’s not just that atheism has peaked globally, but that it did so around 1970 with a population of 165 million. Since 2000, the number of atheists have dropped almost 400,000 and the future doesn’t look much better for atheists. By 2050, atheists are expected to fall to just over 125 million. Agnostics are growing, but not for long. Those who claim to be unsure of God’s existence climb to more than 700 million by 2025, but fall back under by 2050. Their decline means the number of non-religionists peaks at slightly over 834 million in 2025. In 1970 around 19 percent of people in the world were classified as a non-religionist. Today, that number is closer to 11 percent. By 2050, less than 9 percent of the world’s population will be an agnostic or atheist. 3. Evangelicals are growing rapidly. By comparison, from 2000 to 2015, Christianity overall grew 1.32 percent, Islam grew 1.88 percent, and Hinduism grew 1.26 percent. Evangelicals grew at a 2.13 percent rate. That global growth rate is better than Roman Catholics (1.13 percent) and Protestants as a whole (1.62 percent). Evangelicals will grow from 4.5 percent (328,582,000) in 2015 to 6 percent (581,134,000) of the world’s population in 2050. That type of growth is only eclipsed by one other group. 4. Pentecostals will climb to more than 1 billion by 2050. In 1900, there were less than 1 million Pentecostal and Charismatic Christians in the world. Today, there are more than 640 million. By 2050, they will top 1 billion, which means that in 35 years, more than 1 in 10 people around the world will be a Pentecostal/Charismatic Christian. 5. We are reaching the unreached. In 1900, more than half of the world’s population (54.3 percent) was unreached with the gospel. Today, that percentage is down to 29.3 and will drop another 2 percentage points by 2050. That doesn’t mean the job is finished. It is still the case that almost 1 in 3 people on Earth (more than 2.1 billion people) have not been evangelized. And the number of international missionaries dropped in the last 15 years. But the gospel is spreading. In 1900, only 4.3 percent of non-Christians even knew a Christian. In 2015, that number stands at 14.1 percent and is expected to climb to 15.4 percent in 2050. Much of that comes from the spread of the gospel into predominately non-Christian nations. More than 100 years ago, 95 percent of all Christians lived in a nation that was at least 80 percent Christian. Today, that’s the case for just over half (52.6 percent). By 2050, the number falls to 48 percent, which means most Christians will be living in a country that is more than 20 percent non-Christian. 6. There are less martyrs today. While it may seem Christians are dying for their faith today more than ever, the numbers from this report don’t seem to support it. That’s not to say no Christians are martyred. The nightly news reminds us this is not the case. But, according to these numbers, it is better now than it has been. Open Doors, a non-profit organization serving persecuted Christians, tries to find a more exact number each year. In 2013, they reported martyrdoms almost doubling from 1,201 in 2012 to 2,123 two years ago. Their most recent statistics report 322 Christians are killed for their faith each month, which would put the current number even higher at around 3,800, but still lower than the numbers estimated in the Gordon-Conwell report. Taking their averages, Gordon-Conwell’s study concludes that martyrs peaked in 1970, when 370,000 Christians were killed for their faith. In 2000, it was down to 160,000. That number is expected to bottom out around 100,000 in both 2025 and 2050. Each of those deaths are to be mourned, and we should do all we can to prevent them and discourage religious persecution around the world. But we should also acknowledge the improvements that have been made, according to this report. 7. More than 100 million Bibles will be printed per year by 2025. Currently, 82.6 million Bibles are printed each year. That number will climb to 110 million in 2025 and 135 million in 2050. More of God’s Word is getting out to more people than ever before. Currently, more than 5 billion pieces of Scripture are printed each year. By 2050, that number will almost reach 1 trillion. 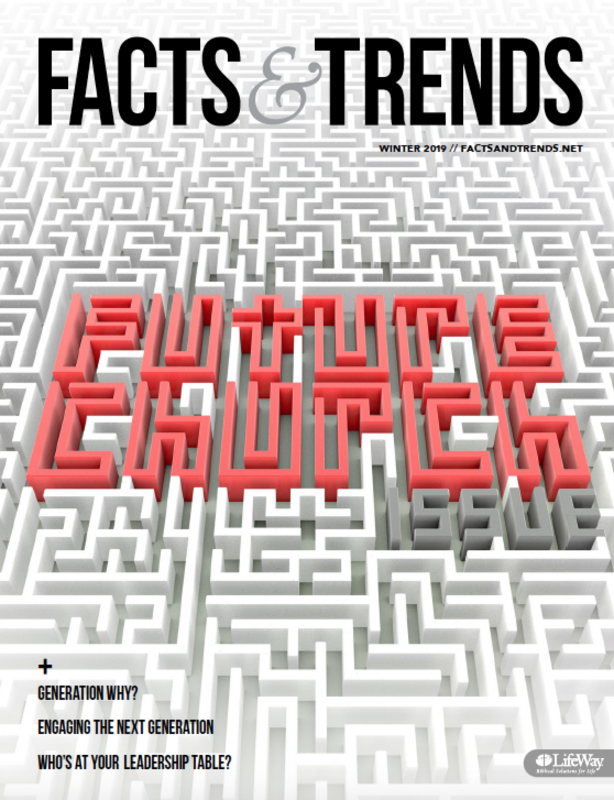 AARON EARLS (@WardrobeDoor) is the online editor of Facts & Trends. Re #5, we are reaching the unreached: in one sense, yes: the world was half unevangelized in 1900, and today it’s more like 29%. But in another sense, no, we are not: because the absolute numbers of unreached people have grown from 800 million in 1900 to over 2 billion today. The number of unevangelized individuals is growing by about 52,000 per year: our evangelistic effort is huge but not keeping up with population growth. (Documentation: Status of Global Mission, published annually in the International Bulletin of Missionary Research). Thanks for giving the other side of those numbers and offering some perspective, Justin. Do we have estimates of the yearly numbers of converts from Islam to Christianity and vice versa? I do not, Duane, and I don’t think this study has that. It would be interesting data to have and investigate though. Aaron, this is just what I needed to read today! Like you said, sometimes it seems like “Christianity is in global peril.” It is good to know that Christianity is ,in fact, growing! This is a comforting thought. Hopefully that means that my husband and I will be able to easily find another Christian Church to attend once we move to our new home! Do we have an estimate when the number of Protestants worldwide will surpass the number of Catholics worldwide? It’s interesting to see that the current trend is toward faith, and not away from it. It would be even more interesting to see what that is attributed to. An increase in people joining Christianity, or an actual decrease in athiests/agnostics due to them choosing Christianity (or another religion)? Either way, it’s encouraging to hear that Christianity is not dying, contrary to what many would think. I really liked reading about how Christianity is still growing all across the world. It was also fantastic to know that the gospel is being preached in places that currently haven’t heard of it. Knowing that I am part of a fast growing family is fantastic, and I hope to raise my kids with Christian morals in our home so they can later teach their children the same. Thank you for your post, it gives me hope for my children’s future!